Lock in a great price for Grand Forest Metsovo – rated 9.3 by recent guests! A jem of a hotel- beautiful location and fantastic staff and facilities- perfect! The breath taking view. Spacious room and comfortable bed. The indoor pool was great and staff was super nice and approachable. The breakfast had a lot of variety and tasty food. Superior view. Very good quality rooms. Super quality bathroom. Nice (two) swimming pools. Helping and willing staff. The hotel is really classy, the view is breathtaking and the food is really really good. High quality hotel in an excellent location on the mountain, with a calm feeling, amazing views, helpful stuff, outside pool watching the mountains. To run from the world with style. The restaurant is excellent! We ate there several times and everything was delicious and great presented. Plus the service is wonderful. A place to come back. Exquisite surroundings, fabulous design in stone and wood and a truly gourmet dinner in an elegant dining room. Grand Forest Metsovo This rating is a reflection of how the property compares to the industry standard when it comes to price, facilities and services available. It's based on a self-evaluation by the property. Use this rating to help choose your stay! One of our top picks in Metsovo.Set amid a pine tree forest, on a hillside of Pindos, Grand Forest Metsovo features an elegantly decorated gourmet restaurant and a mountain-view bar. Facilities also include a farm with horses, and a spa center with indoor pool, hot tub and sauna. Fitted with wooden floors, dark-wooden furnishings and soft colors, the rooms and suites of Grand Forest enjoy views over Pindos Mountain. Each is equipped with a mini-bar, flat-screen satellite TV and orthopedic mattresses. The marble bathroom comes with bathrobes and branded toiletries. Some units feature a fireplace. Guests can start their day with an American breakfast served daily at the dining area. Traditional flavors and gourmet dishes prepared with fresh ingredients and accompanied by fine wine can be enjoyed at “Metsovo 4429 ft” restaurant for lunch or dinner. Drinks and coffers are available at the on-site bar. Staff at the 24-hour front desk can provide room, car rental and dry cleaning services upon request. Free Wi-Fi is provided throughout. The surrounding area is ideal for hiking, skiing and horseback riding. The center of Metsovo lies within a 15-minute’ drive from the property, while Ioannina Town is 32 mi away. Ioannina National Airport is at a distance of 29 mi and Thessaloniki International Airport is 149 mi away. Free private parking is possible on site. When would you like to stay at Grand Forest Metsovo? -a marble bathroom with branded toiletries and a hairdryer. Please note that this suite is located on the ground floor. This suite features a balcony, fireplace and soundproofing. This suite features a balcony, soundproofing and tile/marble floor. This suite has a balcony, fireplace and iPod dock. Opening to a balcony or patio with mountain views, this room includes a seating area and a bathroom with branded toiletries, bathrobes and slippers. House Rules Grand Forest Metsovo takes special requests – add in the next step! Grand Forest Metsovo accepts these cards and reserves the right to temporarily hold an amount prior to arrival. Please note that children under the age of 18 are not allowed to access the indoor swimming pool or any other spa area. The food in the restaurant was overrated, the taste was mediocre and at a very expensive price. The road to the hotel was bad and we felt like our car was damaged. The rooms were far away from the main restaurant and we had to walk outside in cold. (It was not a close corridor). The swimming pool was small. The spa was with extra charge. The room was ok without a fireplace. It was not what I expected. We had a Greek traditional breakfast that was really nice with fresh ingredients. The room was big with comfortable bed and great view of Metsovo. I really like the view from the swimming pool. The restaurant had great food for dinner. The Wi-Fi was the only real let down - neither of our mobiles managed to connect in a week's time and there's no mobile connection in the room either. Also be prepared to get flooded every time you take a shower - the shower door drips all the water on the bathroom floor due to poor design. Finally, maybe not in the control of the hotel, but still. If your neighbours smoke in the room, expect your own room to be full of smoke - it all gets pulled in through the ventilation system. Noise insulation can also be a problem. Overall an excellent hotel! Room was perfectly clean. Great bed for a good night's rest. Staff were all very pleasant, helpful and professional. Great food at reasonable prices. The lobby with a fireplace is an excellent location for your evening drink and some work on the laptop. The views are obviously breathtaking. Spa experience was great - they really pay attention to every detail of your visit. We were personally shown around the hotel and provided with a handout of things to do nearby - nice little personal touch. Wifi not so reliable in room but fine in communal areas. Taxi fares are expensive but necessary if you don't have a car. Outstanding decor, comfort and views. Close to ski facilities and Metsovo town. wifi was off, heating in the room was below average.. The temberature of the room was to high during night! I would have loved some more greek specialities on the menu (we couldn´t even get Tzatziki). The TV in the room could have been bigger, as well as offering international channels. I was looking forward to horse-riding, but they didn´t offer it for the time we were there. Wow! This place is magical. 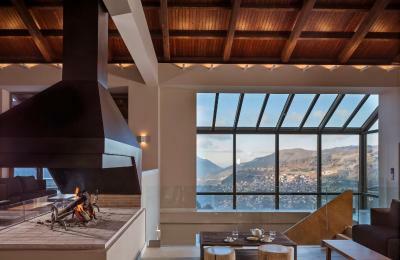 The architecture of the hotel, the location within the forest, the view over the valley towards Metsovo. It was all topped of with days of snow, which really added to the beauty. The road was cleared everyday though, so driving was still possible. Romm service was great. The breakfast had everything you could wish for. We stayed over New Years and enjoyed a special dinner with live music. The pool and spa as well as the treatments were very good. We loved the bars (the one in the lobby and also the Pines Bar, where you can sit by the fireplace - we were always the only ones in there, reading on the extremely comfortable sofas). Even though the hotel was fully booked, it felt quiet and peaceful. Not a five star hotel. First day they hadnt clean the room until 17:00. We had to kindly remind them to do so. Only ONE set of shampoo/conditioner for a family of three. When i asked they said this is their standard policy (but were happy to provide us more). No mirror in the room, only in the bathroom, totally inconvenient. The pool is COLD. The jacuzzi is not pleasant but ok (think temperature of a gym pool) but you have to pay extra in order to use it. This is a spa hotel and you pay a lot (especially during our Christmas holidays stay) not to be able to use the sauna/jacuzzi for free. You have to pay extra to use the fireplace too. In one of the hotel bars only one of the two fireplaces were lit -and we are talking Christmas holidays here. Very uninviting. The views. Food at the restaurant. The staff was kind. The Location and the view is unique, the staff is very friendly and attentive, the spa excellent. Overall a memorable experience!! Everything was excellent. A spectacular winter resort. Great room, staff was very helpful, excellent breakfast. Will definitely visit again.